A temporary wooden trestle supports two diminutive 3-foot gauge steam locomotives and their hopper cars, used to haul fill material from land holdings along Zion Hill to the six mile fill Charles A. Sims & Company constructed for the easternmost segment of the Atglen & Susquehanna Branch. Concurrent to the improvements on the main line at North Bend railroad contractor, Charles A. Sims & Company of Philadelphia was awarded the contract to complete the grading and masonry work for the easternmost segment of the Atglen & Susquehanna project in 1903. Sim's crews began the monumental task of building the new right of way in Sadsbury Township between Atglen (A&S milepost 3.3) west to Milepost 9, just beyond Lamparter Road, a total of almost six miles. Diverging from the shared right of way of the PRR Main Line that ran alongside the ridge of the North Valley Hills, the new line required a massive earthen fill to maintain the gentle grade as it veered southwest into the rolling countryside of Southern Lancaster County, making the ascent to Mars Hill Summit. Workers pose in front of the masonry work of the 60' arch spanning Noble Road and the East Branch of the Octoraro Creek. While it appears that much of the stonework is complete, the task of backfilling the span and wing walls is yet to be completed as construction progresses west toward Mars Hill Summit. Material excavated from various improvement projects had been stockpiled on landholdings in the vicinity of Zion Hill. A six-mile narrow-gauge railroad was constructed to transport the fill material from these deposits, crossing over the mainline on a wooden trestle and on to the new right-of-way via temporary trackage. The usual assortment of manpower, steam shovels and a copious amount of dynamite were then employed to generate additional material needed to construct the new right of way. Part of this six-mile segment involved building the first bridge from the east; a large 60' single-arch masonry structure that spanned the historic Noble Road and the East Branch of the Octoraro Creek. The stone arch and wing walls were erected and then backfilled with material hauled in by Sim's narrow gauge railroad, a process repeated countless times as the line reached further west into Lancaster County. While Sim's length of the A&S and the rest of the branch has found a renewed purpose as a recreational resource since abandonment in the Conrail era, the arch at Noble Road remains a symbolic portal, marking the crossing from Chester to Lancaster County. More importantly, it is a reminder of the stark contrast between the A&S and the role it played in our national railway network and the quiet life on the farm, typical of Southern Lancaster County. Some time ago we left off on the Main Line tour in Christiana, Pennsylvania, crossing from Lancaster to Chester County, traversing the North Bend Cut along Zion Hill. What seems today like another unremarked view from the Main Line, the area around North Bend was a place essential to operations on one of the busiest transportation networks in the country. In the Brown era of the late 19th Century - early 20th Century, North Bend saw the realignment and expansion of the mainline, construction of the Atglen & Susquehanna Low Grade, the installation of the Atglen water pans, and later in 1938 the final phase of electrification. The endless parade of traffic during World War II was followed by a long, slow decline of the PRR system, visualized by the rationalization of the physical plant and facilities that continued well into the Penn Central, Amtrak and Conrail eras. The photographs here depict over 100 years of change on the ever-evolving railroad landscape. Charles Sims & Co, the contractor, tasked to construct the first seven miles of the A&S Branch erected this narrow-gauge railroad between an area near Zion Hill and the new Low Grade. The temporary line hauled material stored on local land holdings to the new elevated right of way, which required massive amounts of fill to maintain a gentle grade across the undulating landscape of Southern Lancaster County. Moores Memorial Library, Christiana, PA. This 1962 view of an eastbound passenger train winding through the curve at North Bend shows evidence of the PRR's rationing of excess capacity with the removal of two of the four main tracks. While the era of steam has long since passed, a coal-fired boiler house remains, off to the right, once part of the extensive Atgen track pan system that allowed steam trains to take water at speed on both the Main Line and Atglen & Susquehanna Branch (visible behind the structure). James P. Shuman photograph, Railroad Museum of Pennsylvania, PMHC. In this westward view of the North Bend Cut, near the vicinity of Shuman's image, we see two tracks remain, now under the guise of the Commonwealth funded Keystone Corridor, operated by Amtrak. The contemporary railroad landscape without the context of historical images can still present a beautiful study in light and shadow, in this modern view. The Kittanning Reservoir occupies the gap created by Burgoon Run, where J. Edgar Thomson was faced with a decision of spanning the gap or filling the smaller Glen White and Kittanning Runs. The purpose of utilizing the horseshoe design is evident in the elevation changes of the railroad, visible above the gap along the left and right hillsides. In 1851 J. Edgar Thomson, the first Chief Engineer of the young Pennsylvania Railroad began construction of the Mountain Division between the Johnstown area and Altoona. Thomson faced two significant obstacles on the division, how to tunnel through the solid rock walls near the summit and how to get the Main Line from Altoona west up the mountain. An eastbound descends into Horseshoe Curve, seen from the Kittanning Reservoir. Thomson's endeavor for the PRR was not the first route over the Alleghenies in Blair County. The Allegheny Portage Railroad, part of the state-owned Main Line of Public Works completed in 1834, utilized a series ten inclined planes, five on either side of the summit, to surmount the Alleghenies. It proved to be a slow and dangerous part of an already arduous journey that required train, canal and these inclined planes to travel across the Commonwealth, taking some 4.5 days. View eastward from atop of Tunnel Hill, where Thomson faced the challenge of building the line through solid rock requiring cuts and tunnels nearing the Summit. Thomson opted to by-pass the troubled Main Line of Public Works and the APRR all together, turning west from the Juniata Valley in Altoona. To maintain a route with a ruling grade of 1.8% the new railroad would hug the foothills toward the summit, utilizing the natural topography of the ridge to Kittanning Point. Here, the Kittanning and Glen White Runs converge in the valley of Burgoon Run creating a significant challenge. Faced with a decision of spanning the considerable gap of Burgoon Run, Thomson, instead employed Irish laborers wielding pickaxes and shovels to fill the gaps of Kittanning and Glen White Run and thus completing the arced curve around Burgoon Run that became known as the Horseshoe Curve. A helper set nears the point of the Allegheny Summit in Gallitzin, Pennsylvania, west of the Gallitzin and Allegheny Tunnels. The line over the Alleghenies and Horse Shoe Curve opened on for service on February 15, 1854. Though the State Works attempted to improve their route by opening the New Portage Railroad in 1855, it ultimately failed, later becoming part of the PRR system, serving as an alternative route in times where traffic warranted its use. After 164 years of continual operation Horseshoe Curve continues to be a vital piece of rail transportation infrastructure, a testament to Thomson’s engineering ability in constructing one of the most celebrated railroads in American history. 9 New Jersey Photographers | Stockton University - Through March 28th, 2018 | Pictorialism, Pure or Straight Photography, Modernism, Social Documentary Photography, Post Modernism - like any other art forms, photography has had its share of dominant styles promoted by leading practitioners, critics, curators and by publications, and enshrined in galleries and museums. But today every style, every ism, every mode of making and printing photographs vies equally for attention and appreciation. This group of New Jersey photographers represents that diversity in striking ways. Some document the actual world unadorned, from images of the landscape to those of the inner city. Some make pictures that are totally abstract. Some take the world as it is. Some construct what they are going to photograph. Some print using present digital technologies, some using traditional 20th-century chemical processes, some using older alternative photographic processes. Some do not even use a camera, relying instead on light itself or even photographic chemicals alone to create an image. In an era where almost none of the billions of photographs made every year are ever printed, this exhibition not only presents some of the wide diversity of image making among photographic artists today, but allows us to contemplate the exquisite nature of the photographic print as an object. I am honored to be part of this incredible exhibition curated by Stephen Perloff, editor of the Photo Review and the Photograph Collector. The exhibition, featuring the work of 9 NJ based photographers is on view through March 28th, with a closing reception and talk with Curator Stephen Perloff on Tuesday, March 6th at 5 PM. The Stockton University is located at 101 Vera King Farris Drive, Galloway, NJ. The campus Art Galleries are located in L-wing adjacent to the Performing Arts Center; visitors can park in Lots 6 or 7. In addition to the 9 NJ Photographers show, I also have several pieces hanging in two ongoing group exhibitions on view in the Delaware Valley. Perkins 37th annual photography exhibition exemplifies the best and most innovative work by photographers from throughout the Mid-Atlantic region and beyond. This year's exhibition was juried by Hope Proper, renowned collector, former Curator of Exhibitions & Founder of Perkins Center’s Annual Photography Exhibition. 2018 Professional Artist Members Exhibition at the Mainline Art Center, in Haverford, PA. The exhibition is a celebration of the MLAC members’ support and creative energy, featuring a range of works from photography, sculpture, painting, printmaking, and ceramics. Friday through Sunday: 10 AM to 4 PM. A light set of Norfolk Southern helper locomotives nears the Allegheny Summit in Gallitzin, Pennsylvania, on the original line opened by the PRR in 1854. Since the Pennsylvania Railroad started moving trains across the Commonwealth of Pennsylvania, a railroad empire began to take shape, eventually becoming a leader in the industry, an innovator of technology, and the model of the modern corporation. 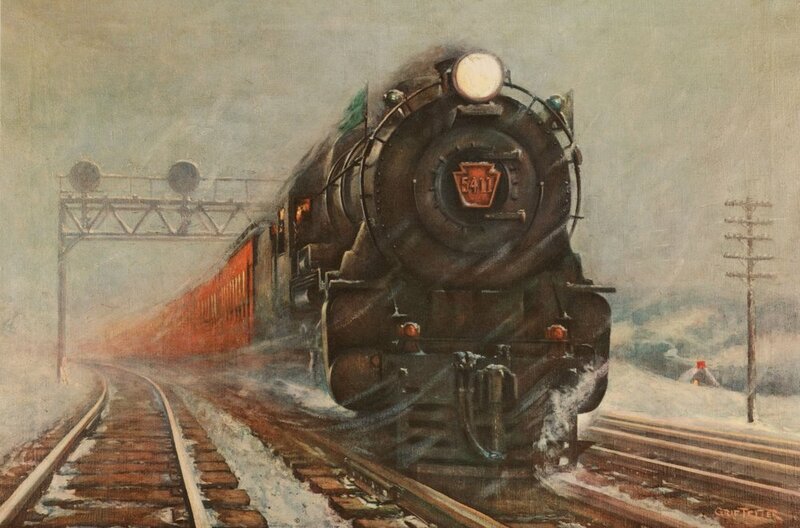 The storied history of the Pennsylvania Railroad is a big part of the American story, connecting people and industry, moving them safely and efficiently across the land. When I set out some time ago to document the Pennsylvania Railroad, I had an idea of what to expect, what I might learn, and what I would see along the railroad. What I did not anticipate, is how many wonderful individuals and organizations I would come to work with or the opportunities I would have to share the Main Line project. Reflecting on another incredible year, I would like to thank you all for your continued support. The Main Line project and all its associated endeavors continue to move ahead, and 2018 is shaping up to be an excellent year for new projects, exhibitions, and opportunities. I have put together some of my favorite holiday posts for you to enjoy and as always new content will resume in the new year. From my family to yours, Merry Christmas, Happy Holidays and may you all have a safe and healthy New Year! Holiday Traditions - This time of year, family and friends come together to celebrate the holidays with traditions developed over generations. As a part of our family tradition, I have the pleasure to read to my children on Christmas Eve as my father did before, the fabled poem, The Night Before Christmas by Clement Clark Moore. First published anonymously in December of 1823, it is now the tradition in many American families to read the poem on Christmas Eve. Former Pennsylvania Railroad Pratt truss bridge spanning the Susquehanna River. Selinsgrove, Pennsylvania. Recently I had the opportunity to talk with Edd Fuller, editor of The Trackside Photographer, a blog focused on the railroad landscape. I am excited to share this interview about my ongoing work and how it ties into a central theme inspired by history. Follow the link to learn more about my process, creative work and how my interest in both the landscape and railroads has woven its way into my projects for many years. To read the interview visit The Trackside Photographer, or click the image above! Northward view, Susquehanna River, Marysville, Pennsylvania. I currently have a piece hanging in the 2017 Members Exhibition at the Mainline Art Center, in Haverford, PA. The exhibition is a celebration of the MLAC members’ support and creative energy, featuring a range of works from photography, sculpture, painting, printmaking, and ceramics. Gallery Hours are Monday through Thursday: 10 AM to 8 PM, Friday through Sunday: 10 AM to 4 PM. This exhibition is free and open to the public. The Main Line Art Center is located at 746 Panmure Road in Haverford PA, offers free parking, and is easily accessible from public transportation. My work will be part of an upcoming exhibition curated by Stephen Perloff, editor of the Photo Review and the Photograph Collector; the show spotlights nine NJ based photographers. An artists reception will be held Tuesday, March 6th at 5 PM followed by a talk with curator Stephen Perloff at 6:30 PM. More information will follow as the event approaches. The Stockton University Art Galleries are located on Lakeside Lane, Galloway, NJ in Galloway, NJ. Parking is available at the Lakeside parking area. Previously, on the former Pennsylvania Railroad mainline we left off in Lancaster County at Mine Ridge, the highest point on the PRR east of the Alleghenies. The route closely follows the original 1834 alignment of the PRR's predecessor, the Philadelphia & Columbia Railroad, crossing through a gap in the ridge between Lancaster and Chester Counties and the divide between the Susquehanna and Deleware Watersheds. From the west, the line climbs the grade between Kinzer and Gap on a series of reverse curves in short succession following a brief tangent, attaining the summit at roughly milepost 50. The eastward descent starts into another 1-degree curve positioning the line into a long straight until reaching Christiana, the last station along the line in Lancaster County. In Christiana, the line again navigates another series of reverse curves flanking the town center followed by a sharp curve at North Bend where the line crosses into Chester County. A modern-day view of the 1912 era Christiana train station. While manufacturing has left communities like this, the historical character and old buildings speak to the Borough's importance in industrial history throughout the United States in the 19th Century. The area around Christiana took root in the 1690's after King Charles II granted William Penn 45,000 square miles of land west of the Delaware River. Originally part of Chester County, Sadsbury Township was part of a land transfer to establish Lancaster Country in 1729. As a result, Sadsbury Township spanned the new county line, and thus became two separate townships by the same name in each of the neighboring counties. By the dawn of the 19th Century, Christiana began to develop around the crossroads of the Lancaster and the Gap & Newport Turnpikes, both major eastern trade routes. The opening of the Erie Canal in 1825 would rival many of these roads taking away commerce and trade from the port city of Philadelphia, thus affecting developing towns along the way. The Commonwealth's answer was to build a state-owned system utilizing a railroad between Philadelphia and the Susquehanna River and a canal system west to Pittsburgh, including a series of inclined planes to cross the Alleghenies. The new rail line, called the Philadelphia & Columbia, brought great promise for developing communities like Christianna. The railroad and the larger Mainline of Public Works would allow people and industry to connect with markets outside their region, providing a potentially unlimited opportunity for commerce. The P&C commenced operations in 1834, around the same time local businessman, William Noble constructed a foundry and blacksmith shop along the line in Sadsbury Township, Lancaster County. Ten years later Hugh McClarron opened a grain and produce business, and by 1846 Samuel L. Denney purchased the foundry from Noble, adding a machine shop to the operation. By 1847 the growing village became officially known as Christiana, named for Noble's first wife. Denny's endeavor followed suit, and the new Christiana Machine became a focal point of industrial commerce in the area. View looking west from the mainline, showing the old (left) and new (right) alignments of the right of way. Soon the old right of way and overpass would be removed. Cattle pens and a siding in the immediate foreground are in the vicinity of the freight house which still stands today. Note the absence of the fourth track which indicates that this view was before 1895. Library of Congress HAER collection. Annotated map of the Borough of Christiana illustrating the original P&C alignment (red) and the relocated mainline (white), part of the PRR's line improvements completed in 1895. Note the Atglen & Susquehanna Branch in the bottom left, which would not be completed until 1906, joins the right of way to the east of here. By the 1880's the failed Mainline of Public Works had long since been sold to the Pennsylvania Railroad, putting Christiana alongside one of the most ambitious interstate rail transportation systems in the land. The town itself thrived, now a borough of 800 residents, complete with a new library association, bank, and town newspaper. Christiana was home to a diverse base of manufacturing with much of its output shipped by rail. Christiana Machine, once again under new ownership, evolved from making farming implements to the production of water turbine equipment and later other elements for power transmission systems for shipment all over the developing nation. Growing with the ever-increasing traffic demands the PRR was amidst an era of improvements in the 1890's, addressing both capacity and infrastructure limitations. Symbolized by the PRR's impressive stone bridges and four-track system, the improvements program targeted issues that stemmed from the early construction of the right of way. In this particular region, the engineers and contractors building the P&C mainline encountered springs, and quicksand while excavating the pass over the Gap Summit. The compromise was less cutting to avoid the muck resulting in steeper grades. Cheif Engineer William H. Brown looked to finish what the P&C could not accomplish some fifty years before. As a result, measures were taken to re-grade and realign the railroad between Gap and North Bend. In Christiana, the tracks were shifted from the old P&C right-of-way to a new alignment altogether, moving the tracks some 150' to reduce the curvature and accommodate the expansion of the right of way to four tracks. The realignment necessitated moving the large brick freight house some 40' east and the abandonment of the existing Bridge Street overpass. Construction of its replacement called for the use of a "new" Whipple style iron truss span, repurposed from improvements undertaken on the Philadelphia, Wilmington & Baltimore, where the mainline crossed White Clay Creek below Wilmington. The remains of the original Philadelphia & Columbia stone arch bridge crossing Pine Creek still survive despite being part of the right of way that was abandoned during the 1890's line improvements between Gap and Atglen, Pennsylvania. The structures at the left are part of what was Christiana Machine, one of the first industries in Sadsbury Township to take advantage of the railroad's expanded market reach. At North Bend, where the railroad arcs from a north-south to an east-west orientation through the gap in the North Valley Hills, a substantial cut was excavated at the base of Zion Hill, accommodating the wider right-of-way, reducing curvature from the previous P&C alignment. The 1895 annual report from the PRR notes the completion of this segment of four track line from Atglen to Gap, among other places. Not much else would change in Christiana except for the construction of a modest new passenger facility and pedestrian subway along the Gay Street underpass in 1912. While Christiana lost passenger service in 1952, the station remained open as a Railway Express office until 1962. Though much of the region's manufacturing shifted away from smaller communities like Christiana, the landmark brick freight house and passenger station survive, the former becoming the home of the Lancaster Chapter of the National Railway Historical Society who restored the building to its original condition. The Lancaster Chapter, chartered in 1936 is the founding Chapter of NRHS and a very accomplished group in the field of preservation of railroad structures and equipment. The mainline today serves the Amtrak Keystone Corridor, hosting some thirty trains a day, still rolling through Christiana and the right of way improvements of the late 1800's. The massive Safe Harbor Bridge was just west of the temporary block station named Fire which was put into service in 1959. The block station and crossovers were located on the A&S Branch up on the embankment pictured here in the top right of the image, the Columbia & Port Deposit Branch is the line in the foreground. In a previous post, Managing the Line, we detailed the operations of dispatching trains on the Atglen & Susquehanna branch, one particular anomaly escaped the article. Thanks to the work of Abram Burnett who interviewed the late H. Wayne Frey a former PRR Block Operator, I am pleased to share an account of a brief occurrence on the A&S that necessitated an additional block station for a short time. On Thursday, July 30th, 1959 Philadelphia Region general order No. 710 was put into effect to address a rising situation on the A&S branch just east of the Safe Harbor Bridge over the Conestoga River. Officials and crews discovered settling in the eastbound main (No. 1 Track) the result of an underground blaze ignited by a recent brush fire on the embankment. Officials found that the fill the A&S rode on comprised of dredged material that was suspected to contain river coal making the soil susceptible to fire. Annotated track chart and General Order No. 710 effective July 30th, 1959 outlining the implementation of temporary block station Fire, Documents from the late H. Wayne Frey courtesy of Abram Burnett. Officials faced the issue of how to mitigate the situation while keeping trains moving through the area. The railroad installed a set of electric powered crossovers and signals between the compromised No. 1 track and the in-service No. 2 track to create a single-track gauntlet of approximately 700 feet. The railroad established a block station aptly named Fire; In service 24/7, the small wood shack outfitted with four small table interlocking switches (two for switch controls, two for signals) operated around the clock until sometime between February and April of 1961. The stub-ended sides of the crossovers on No. 1 were retained to house tank cars supplied by Dupont Chemical who was contracted to extinguish the fire. 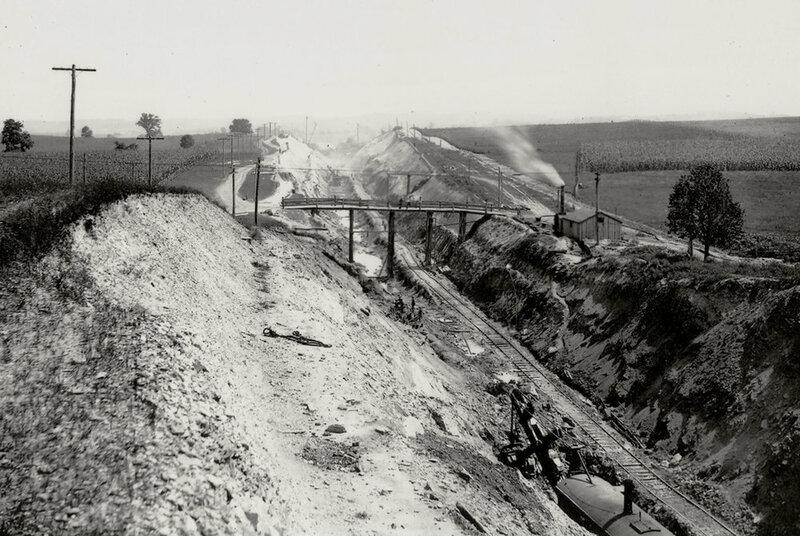 As a means to prevent the situation from compromising the No 2 main track, the railroad drove sheet piles in between the tracks and installed a pipe system to feed the chemicals and water down into the subterranean fire. Late in 1959, the nearby Susquehanna River was experiencing particularly severe ice jams that impacted the Columbia & Port Deposit Branch located at the bottom of the same smoldering embankment. A road crew on the Port Road brought a train to stop in the vicinity of Safe Harbor due to ice when an underground explosion occurred blowing out a part of the embankment. Fearing the worst the crew jumped from their locomotive. Fortunately, the worst injury was the broken ankle of the engineer, and there was no significant loss of life or property. In the first quarter of 1961, Dupont successfully extinguished the fire, and the A&S resumed normal operations. With No. 1 track rebuilt and the tempory switches and signals removed, the railroad closed its newest block station just shy of two years in existence. Greetings! As we wind down from Summer and enjoy the Fall like weather that seemed to come a month early in the Northeast, I wanted to take a moment to play catch up on a few things as I prepare to release some new content on the Main Line tour of the former Pennsylvania Railroad. We left off in southeastern Lancaster County chronicling the Main Line and Atglen & Susquehanna Branch as they approach the Chester County line along the South Valley Hills. Before I get started on new content, I figured it might be fun to put together a post recapping some of the articles that lead up the current position in the series since they have spread out over two years! Looking west into Eby's curve the railroad traverses a fill across the timeless Amish farmland as it enters the Pequea Valley. The curve used to host four main tracks like much of the main line, but much of the heavy tonnage would be diverted away from this segment after the Atglen & Susquehanna branch opened in 1906. Crossing Mine Ridge | Passing through the pastoral Lancaster County landscape the eastbound ascent of Mine Ridge takes the PRR mainline around a series of reverse curves that carry the railroad over the 560’ summit dividing the Pequea and Chester Valleys. Gap, a quaint community whose history dates back to when William Penn visited the area late in the 1600’s is located at the crossroads of the Philadelphia & Lancaster Turnpike and the Newport Turnpike. Typical views between Lancaster and Lehman Place Junction include simple frame buildings and unspoiled views of the rich agricultural landscape inhabited by the Amish and Mennonites. God's Country | The PRR in Eastern Lancaster County - Leaving the city of Lancaster behind, the Main Line of the Pennsylvania Railroad snakes its way through small hamlets like Bird in Hand, Ronks, Gordonville, Leaman Place Junction and Kinzer arcing gently through the heart of central eastern Lancaster County. Known as Pennsylvania Dutch Country, this area is home to a large population of Amish and Mennonite farmers offering a unique contrast between modern living and the simple life these people traditionally live. The Downingtown & Lancaster Branch | On Philadelphia Division, we take a diverging path from the Main Line and Low Grade as we leave the Lancaster area to explore the former Downingtown & Lancaster Railroad, an interesting branch line operation that may have been the result of early efforts to expand the PRR soon after its charter. 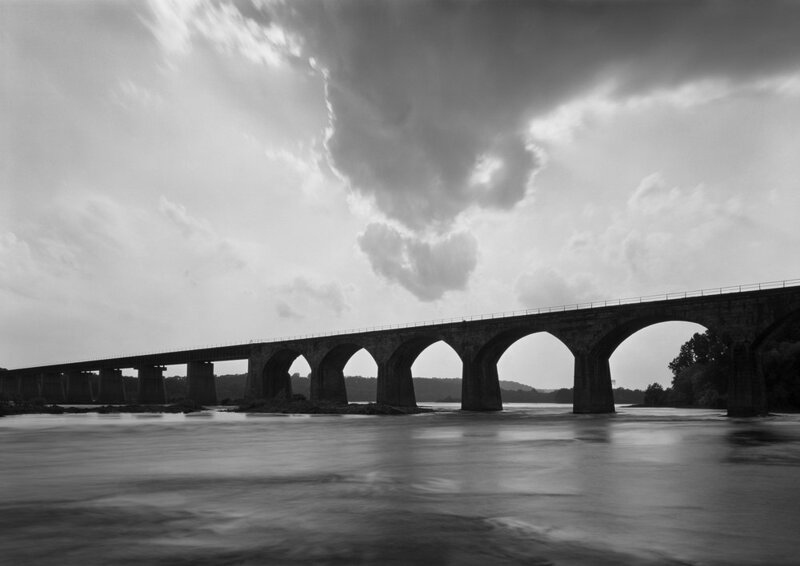 In a beautiful image by William H. Rau, we see the Conestoga River bridge, one of Brown's first stone bridges. Utilizing the figure and boat as a device for scale in the foreground Rau is looking south, as noted by the finished facade of the bridge. To the left out of view is the Lancaster Water Works which still survives today. 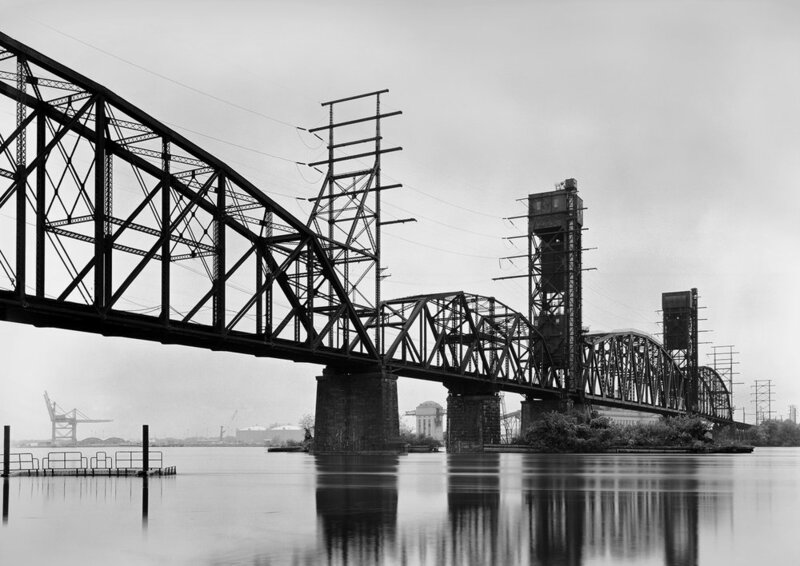 Photograph collection American Premier Underwriters, Inc.
William H Brown: The Tale Of Two Bridges In 1881 a rising figure in the Pennsylvania Railroad by the name of William H. Brown was promoted to chief engineer. At 45 years old the Lancaster County native had 31 years under his belt working his way from a rod man on a survey crew in 1850 to the top of one of the most ambitious engineering departments in the railroad world. Brown had a reputation for knowing every grade, curve, and crossing on the PRR. As the chief engineer, his tenure was likely one of the most notable in the transformation of the Pennsylvania Railroad’s physical plant. As built the Lancaster Cut-Off was intended to bypass traffic not serving the City of Lancaster; the route is the sole surviving main line for Amtrak and Norfolk Southern operations based out of Dillerville. On the east end of the Cut-Off, the grade of the Old Line is visible at former CG interlocking where the two lines split. (L) In the brush to the left, you can make out the diverging path of the Old Main in the gap in the trees. (R) The broad area around the railroad looking east is where the Old Line connected to the Cut-Off and Main Line east. Just out of view is the Conestoga River Bridge. New Line: PRR's Lancaster Cut-Off | Opening in 1883 the Lancaster Cut-Off was part of a series of main line improvements to eliminate excessive grades, traffic congestion and operational issues associated with the original main line through downtown Lancaster. Under the direction of chief engineer William H. Brown a two-track bypass running along the city’s north side was constructed between Dillerville and an interlocking named CG where it joined the existing main line just west of the Conestoga River. Managing The Line: Communications On The A&S | Running over 53 miles in length the PRR's Atglen & Susquehanna Branch was a shining example of modern railway construction, running across rolling countryside and up the Susquehanna River on a gentle gradient. Fittingly for such a contemporary piece of railroad engineering, another advancement of modern times accompanied the line: the telephone. Quarryville: 19th Century Railroading With Big Aspirations | Quarryville has always been a crossroad of activity in the fertile farmlands of Southern Lancaster County. Farmers purchased lumber, grain, and fertilizer here and reciprocally exchanged their bounties in town and beyond via the local county railroad, a lifeline to the outside world. Commonly known as the Quarryville Branch this rail line had an interesting early history that started with big hopes and ended with financial disaster. The Engineer And The Contractor | BY 1903 William H. Brown, the man who earned the nickname the stone man for his preference of masonry bridge construction was winding down a rewarding 44-year career with the Pennsylvania Railroad, 32 of which he served as Chief Engineer. Brown's tenure was part of an era that was arguably one of the most transformative times for the PRR's infrastructure and right of way. His role in the construction of the Low Grade, especially the Atglen & Susquehanna segment would be his last major project before reaching the mandatory retirement age of 70. The Cost Of Labor: Constructing The A&S | Today when you walk along the path of the former Atglen & Susquehanna Low Grade it is a very peaceful experience. There’s no shortage of lush foliage shrouding rock cuts blasted out of the rolling hills, the elevated fills and stone masonry look they were there since the beginning of time, and the railroad itself is long gone. Today it is hard to fathom the purpose of such a resource and even more challenging to imagine the human struggle that was involved in creating such a line. View looking south from the Martic Forge Trestle reveals the rugged terrain the PRR had to contend with when creating the Low Grade, cutting through hills and spanning valleys to maintain an acceptable ruling grade for moving high volumes of heavy freight. Revisiting The Atglen & Susquehanna | Returning to the Atglen & Susquehanna Branch, part of the PRR’s Low Grade freight network we pick up from Shenk’s Ferry where the line pulls away from the Susquehanna River to cross southern Lancaster County. From the high fill above the river the A&S makes a hard turn east to face the first formidable obstacle; crossing the switch back divide between Martic and Conestoga Townships in the rugged Pequea Valley. In conjunction with the ongoing exhibition William H Rau, Urban, Rural, Rail, I will be speaking at a symposium along with Penn State - Altoona history lecturer Julie Fether who curated the show. My talk will focus on Rau's imagery and how it continues to inspire my project, while Julie will discuss how the show evolved, tying in influences from Harvard Landscape Studies Professor, John Stilgoe's writings and ideas on the "art and practice of 'seeing' landscape." If you are in the area, please join us! The event is at the SAMA - Altoona location on Wednesday, August 16th from 11AM-1PM, lunch provided, and costs $15 ($14 for SAMA members). Reservations are required by calling the museum at (814) 946-4464 or emailing altoona@sama-art.org. The current exhibition on display at the Southern Alleghenies Museum of Art, Altoona has more than a month remaining and is generating a lot of great feedback so far. The exhibition features a selection of Rau's Pennsylvania Railroad images from the Altoona Public Library collection, along with several images from the Main Line Project. If you are in the area, the exhibition at SAMA - Altoona is a must see! Greetings! I hope everyone is having a great summer and taking some much deserved time off to enjoy the season with family and friends. Here is a quick list of some upcoming and ongoing events pertaining to the Main Line Project! Semi-automatic signals beckon outside the window of the station waiting room in Chester, Pennsylvania on the former Chesapeake Division mainline to Washington D.C., 2016. I am very excited to have a new article featured on the blog, The Trackside Photographer this week. The piece focuses on the Pennsylvania Railroad's classic Position Light signals, many of which face an uncertain future as railroads push to implement Positive Train Control. It's a sizable article featuring a lot of imagery, several which have never been published. Please pay the Trackside Photographer a visit if you haven't already, they are doing a fantastic job featuring a diverse range of photographers and writers whose work focuses on the railroad landscape, it's an honor to have work published there! Plate 36. B.Q. Tower and Signals - Bellewood, Pennsylvania, Middle Division (III-895), William H Rau, Altoona Public Library Collection. 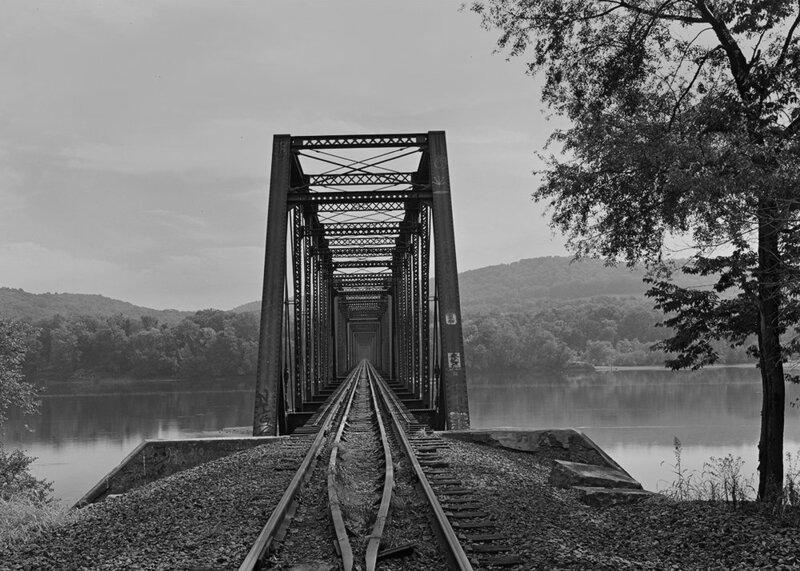 One of 27 images currently on display in the exhibition William H. Rau: Urban, Rural, Rail at the Southern Alleghenies Museum of Art - Altoona. In conjunction with the ongoing exhibition, I will be speaking at a symposium along with Penn State - Altoona history lecturer Julie Fether who curated the show. My talk will focus on Rau's imagery and how it continues to inspire my project, while Julie will discuss how the show evolved, tying in influences from Harvard Landscape Studies Professor, John Stilgoe's writings and ideas on the "art and practice of 'seeing' landscape." The event is at the SAMA - Altoona location on Wednesday, August 16th from 11AM-1PM, lunch provided, and costs $15 ($14 for SAMA members). Reservations are required by calling the museum at (814) 946-4464 or emailing altoona@sama-art.org. On display through September 30th. An excellent opportunity came up recently to showcase some work from the Main Line Project, at the Study, a beautiful new Hotel in University City, central to Drexel University's campus at 33rd and Chestnut Streets, in Philadelphia. The small show includes ten pieces from the project and is free and open to the public. If you're in the area, please stop in and have a look! Photographs & History Celebrates Seven Years! View of the westbound home signal, from the Bustleton Branch, Holmesburg section, Philadelphia, Pennsylvania. Holmesburg was an interlocking and commuter station along the main line and the location where the Bustleton Branch diverged. Countless locations alongside the railroad have a backstory, Photographs & History expands beyond the contemporary photograph to tell these stories. One June 17th, 2010, I mustered enough courage to publish my first post, on the blog, Photographs & History. What seemed to be a monumental event was, in reality, two sentences and a photograph, but what would come of Photographs & History is another story. I started the blog to explore the importance of pictures in understanding the passage of time, concerning both personal memory and as documents of change. The blog format allowed me to bring historical context to my images, something I had never considered previously. Since starting the blog, history has become a connecting thread throughout many of my projects. Whether personal or commissioned, it seemed natural for the text and historical imagery to be an integral part of my work to further the viewer's experience. Seven years later, here we are! From the early times of using the Wordpress platform to the current format, integrated with my website; I have published over 250 posts, from simple one image location views to more complex pieces like the Main Line Series, the blog has become an essential component of my work. I look forward to future of Photographs & History, in the cue, you can expect more articles chronicling the railroad, insight on my creative process as an artist, and much more. Thank you to everyone who has followed along, I am grateful for your kind words and support over the years! It goes without saying that the work of William H. Rau has had a tremendous influence on my ongoing project, From the Main Line, so it gives me great pleasure to announce that I will have several pieces included in an exhibition at the Southern Alleghenies Museum of Art titled William H. Rau: Urban, Rural, Rail in the heart of Pennsylvania Railroad territory, Altoona, Pennsylvania. The exhibition runs through September 9th and will include a symposium on August 16th in which I will discuss the role of Rau's imagery and how it has both informed and influenced my own. The exhibition has already received some terrific feedback, including this recent feature in the Altoona Mirror. I look forward to sharing more about this incredible show while continuing to explore the dialog with Rau's imagery for both inspiration and historical reference in documenting the former Standard Railroad of the World. Another batch of cutting-edge photographs that captured the Allegheny landscape in the 1890s is now on display at the Southern Alleghenies Museum of Art. “William H. Rau: Urban, Rural, Rail” features 27 albumem and sepia-toned photographs taken by the commercial photographer who was commissioned by the Pennsylvania Railroad. The show, curated by Penn State Altoona history lecturer Julie Fether, runs through Sept. 9. The exhibition takes viewers on a “photographic trip with Rau,” in which “hidden worlds become exposed ‘openings,'” a late 19th-century term used to describe landscape and landscape photography, Fether said. “It shows not just the landscape that the railroad carved through, but the mark that the railroad made on the landscape and in the communities it created,” she said. The exhibition follows the different PRR divisions that Rau tracked, from the Brooklyn Bridge in New York City to Pittsburgh. Rau (rhymes with how) was a successful commercial photographer in Philadelphia when the PRR commissioned him to travel its main line and take pictures of the beautiful scenery in an effort to lure tourists onboard trains. Rau, who died in 1920, produced a total of 463 photographs in his project, 273 of which are considered the Altoona collection and are owned by the Altoona Area Public Library and housed by SAMA. 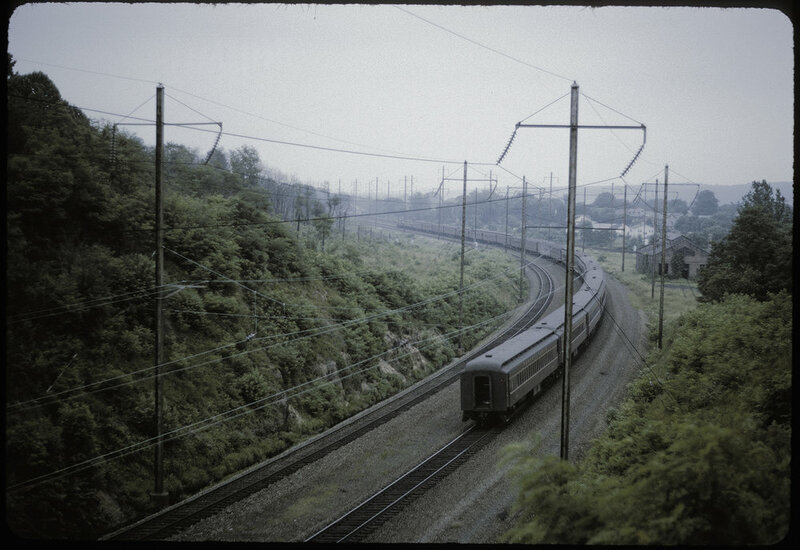 The other photos from the railroad project are owned by The Library Company of Philadelphia. The current show is a follow-up to another exhibition of Rau photographs that Fether curated at SAMA-Altoona in 2015. With the museum only able to display about three dozen at a time, Fether said she had a theme in mind as she sifted through binders of 8-by-10-inch prints in the Altoona collection of Rau’s work. As she was culling, she searched online for other Rau-related work and stumbled on Michael Froio, a Drexel University professor of photography whose contemporary work has been influenced by Rau. The exhibition includes four black-and-white, contemporary pieces from Froio’s own project called From the Main Line that complement and pay homage to Rau’s photographs, Fether said. 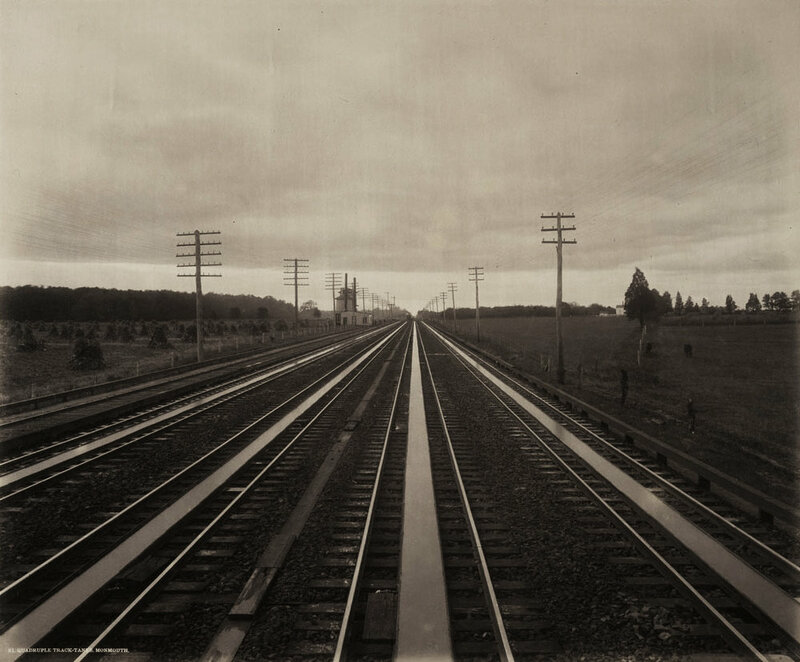 One such work is called “Main Line Looking West, Altoona, Pennsylvania,” and Froio said he clearly remembers the first time he saw Rau’s work. In Images like "Woodvale Yard, Franklin Boro, Pennsylvania", Rau's work both informs and inspires through understanding the history of place while responding to aesthetically choices like the use of light, composition and technical process. It shows “the prominent role the Pennsylvania Railroad played in developing the United States and the continual improvements they made to better themselves in the process,” Froio said. Fether explained that part of Rau’s allure was how technically advanced he was for his time, experimenting with new photographic methods and constantly perfecting the process. Most of his pictures were printed on albumen photographic paper, or a paper coated with egg white and chemicals. PRR provided him with his own rail car, in which he could sleep and produce negatives and prints, and Rau did not disappoint. “It is an absolute honor to be a part of this show, having a chance to hang work next to Rau’s,” Froio said. The public is invited to the program, which costs $15 ($14 for SAMA members) and includes lunch. Reservations are required by calling the museum at (814) 946-4464 or emailing altoona@sama-art.org. At the dawn of the industrial revolution, the American railroad became the vehicle at which life’s pace was set. Growing in the east and expanding across the western frontier the railroad was responsible for America’s success. Engineering such a system at such a rapid speed was no small task, the men who ran these companies understood the value of their accomplishments and wanted to share it with the world. To tout these new transportation systems and lure travelers to ride this modern marvel the railroads turned to another new product of the industrial age: photography. Railways committed major resources to illustrate their networks, employing some the most preeminent photographers of the time. With the Pennsylvania Railroad's corporate headquarters located in Philadelphia, the epicenter of photography in the US during the 19th Century, it was no coincidence that the PRR was one of the largest supporters of this endeavor. The company employed photographers for a multitude of tasks including the glamorous commissions illustrating the railroad and its destinations for the Centennial and Columbian Expositions to the more mundane day-to-day documentation of massive engineering projects taking place all over the system. Grogan Hollow, former PRR Philadelphia & Erie Branch, Clinton County, PA. Contemporary images inspired by historical views: Much like Gutekunst's views of the 1870's my photographs attempt to explain the railroad's context in the modern American landscape, not always focused on the trains themselves but more importantly the landscape they traveled. 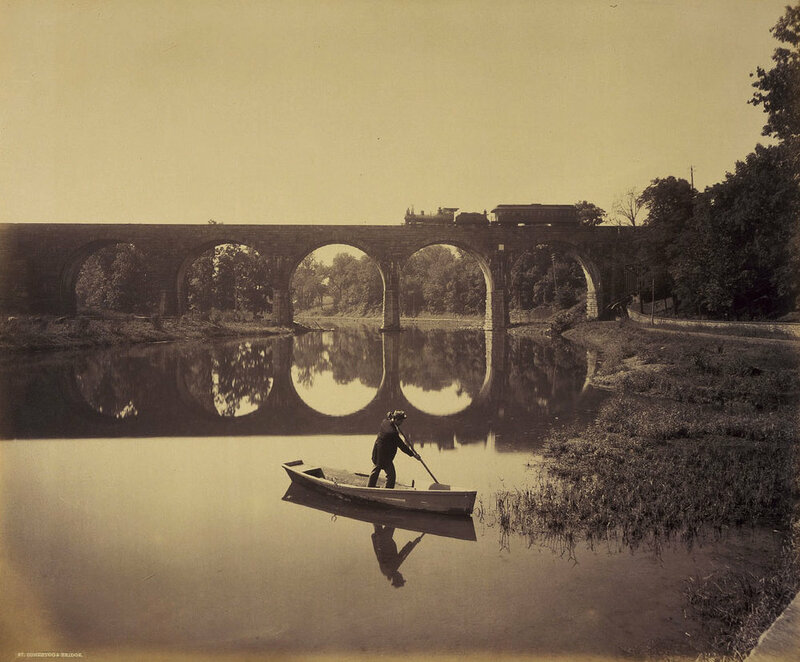 While photography and the railroads redefined the 19th Century’s perception of space and time, surviving imagery leaves us a rich visual legacy to derive tremendous amounts of information about the railway, the landscape and the energy of the industrial age. It is this imagery that feeds my creativity and imagination, which allows me to visualize the prominent role the Pennsylvania Railroad played in developing the United States and the continual improvements they made to better themselves in the process. These volumes of visual assets are the foundation of what inspires my work; the photographer’s technical and aesthetic ability, the conceptual ideas and the resulting images rich with information foster a continued dialogue with my image making, inspiring new works from views of the past. This is a brief excerpt from the upcoming lecture “Continuing a Legacy, Photographing the Pennsylvania Railroad” which I will present next Tuesday, May 9th for the Harrisburg Chapter of the National Railway Historical Society. The lecture is part of the Harrisburg Chapter’s monthly meeting and is free and open to the public. Please join me Tuesday, May 9th for the rescheduled lecture for the Harrisburg NRHS chapter, exploring the important role historical imagery plays in my ongoing project, From the Main Line, A Contemporary Survey of the Pennsylvania Railroad. The lecture is part of the Harrisburg Chapter’s monthly meeting and is free and open to the public. Buy a Print, Support a Great Cause! This piece will be part of the Main Line Art Center's 2017 Spring Gala and Fund Raiser exhibition. The Gala is Saturday, April 29th, and the exhibition runs April 30th through June 3rd, 2017. Please visit the Main Line Art Center's Website for more information. Please, join me for a lecture I will be giving Saturday, April 29th, exploring how my creative projects lead to large scale project documentations for Conrail Shared Assets. The lecture will discuss the technical challenges, equipment, and logistics of documenting three major railroad infrastructure projects in the Delaware Valley. Through previously unreleased images, videos and plenty of behind the scenes views, the presentation illustrates what was required to accomplish a cohesive and creative documentation of classic large-scale railroad engineering projects. April 29th, 1:30 PM. The lecture is free and open to the public. Due to the impending Nor'easter, the Harrisburg Chapter has decided to cancel the lecture for Tuesday, March 14th; the event will be rescheduled for May 9th. I will send out more information as the new date gets closer.